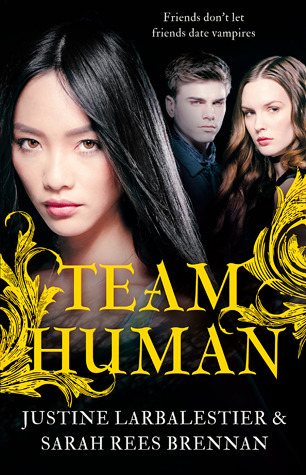 Team Human by Justine Larbalestier and Sarah Rees Brennan is a YA paranormal romance novel with a humorous take on just what falling in love with a way old english vampire means for an American teenage girl, and what it means for her friends. I gave it 4 stars on Goodreads. I’ve seen this book called satirical however satire is generally more destructive in my experience (I took a class on Evelyn Waugh, so I feel like this experience is reasonably well founded). Team Human parodies the conventions of the paranormal romance genre, of romance in general and specific stories we all know well (cough Twilight cough). However, the characters are people who you care about and relate to, and the plot develops to a satisfactory, if a little surprising, resolution. Team Human is book that makes you laugh nearly every scene, though I also shed a few tears. I recommend it to anyone who enjoys YA, romance, vampires, literature, laughing…. Doesn’t matter if you hate or love vampire stories, this book is for you. Team Human is a hilarious, beautiful book that both celebrates and pokes fun at vampire romance stories. Cathy, Mel and Anna all have different experience (or lack of) and opinions about vampires and everything changes when a male vampire (who was turned at 17 and happens to be a lot older than that) conveniently turns up to attend their high school, ensuring someone (or the whole school) must fall desperately in love with him. Told from the perspective of Mel, the story explores friendships, family, love, and the immensely complicated situation of teenage decision-making. While laughingly celebrating vampire traditions, Larbalestier and Brennan create a quirky alternate history, one in which vampires and humans co-exist (mostly) peacefully. The humour is sharp and witty, the plot intriguing and unexpected, and the characters loveable and sometimes a little ridiculous. I loved the way the text played with its genre(s) and the references to other literary works. This is something I always enjoy in a story, and it was well done - adding to the reader’s experiences but not (I don’t think) detracting from a reader’s experience if they’re not aware of the reference. The authors were clearly intentional in having a diverse representation. This is great to see in YA, clearly demonstrating it is not that hard to have a non-white protagonist, or to more accurately reflect the American demographic. There are a variety of well developed characters in the book, all of whom are different and interesting, rather than stereotypes or stock characters, the minor characters often subverted stereotypes or at least poked fun at them. "Friends don't let friends date vampires" is the best tag line.